After a couple of days at beautiful Emerald Bay Marina it was time to move on. Prior to leaving we managed to do lots of laundry in their “free” washer and dryers, attend their Monday evening cocktail party, and make good use of the free internet. The only downside to Emerald Bay is its isolation on the north end of Great Exuma. With the nicest clubhouse we have seen since leaving the states we enjoyed the isolation. We also met a couple who docked right next to us the day before we left. While we only chatted for a short period of time our travels would bring us together again on several occasions and we would eventually become very good friends. More on that later. Cat Island was to be our first stop out of the Exumas. It was an easy 50 mile trip across Exuma Sound to our anchorage at New Bight. During the crossing we trolled out two lines hoping for a good catch. I had yet to clean my first fish and was determined to make it happen. At over one mile deep in spots the sound is known for its excellent fishing. Halfway across it happened. 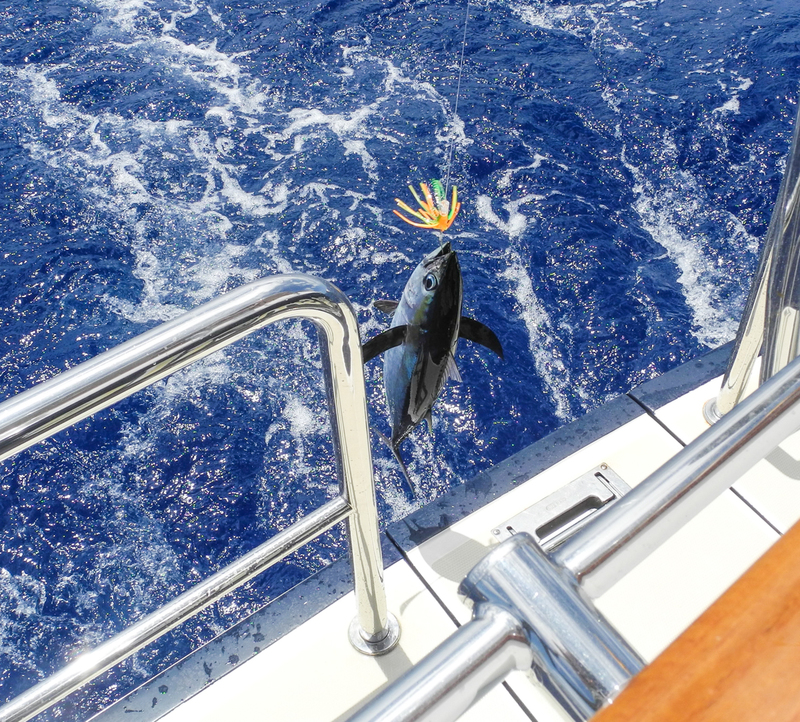 A line went taut and on it was a beautiful Black Fin Tuna. A keeper for sure. 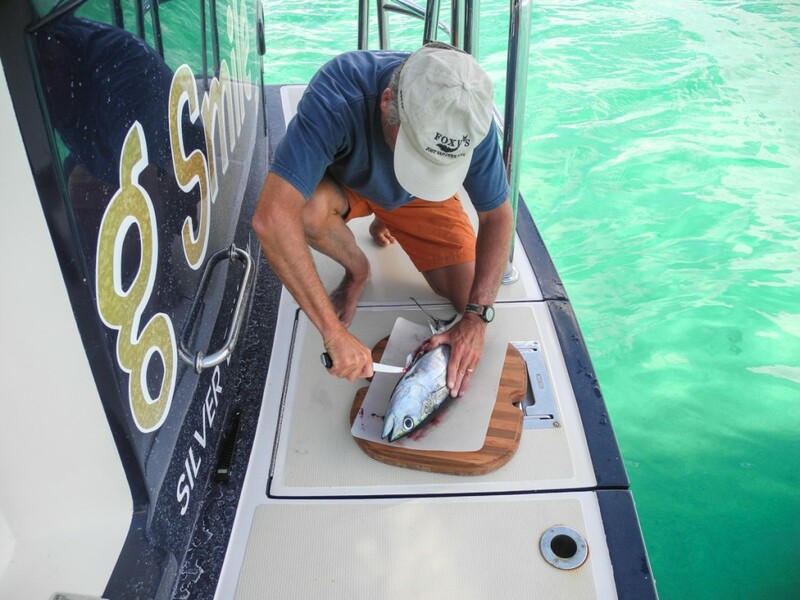 Once at anchor I set about cleaning and cutting tuna steaks which we ate that night. Man they were good. 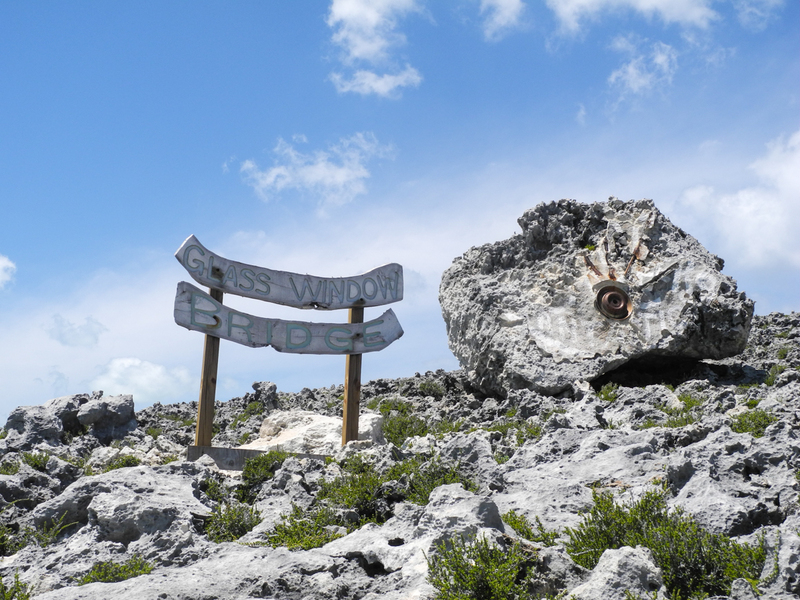 Cat Island is sparsely populated but does have the distinction of having the highest elevation in the entire Bahamas. Mt Alvernia, at 206 feet above see level, is directly east of New Bight settlement. 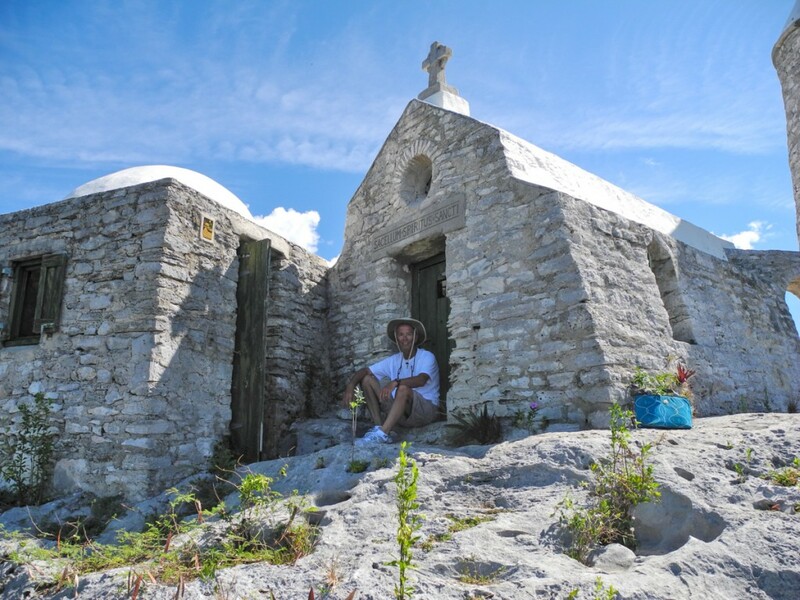 At the summit of Mt Alvernia is a hermitage built by a Catholic Priest named named John Hawes. Father Jerome as he was also called lived at the Hermitage for many years and died in 1956 at the age of 79. We walked up the hill from New Bight to tour the hermitage. 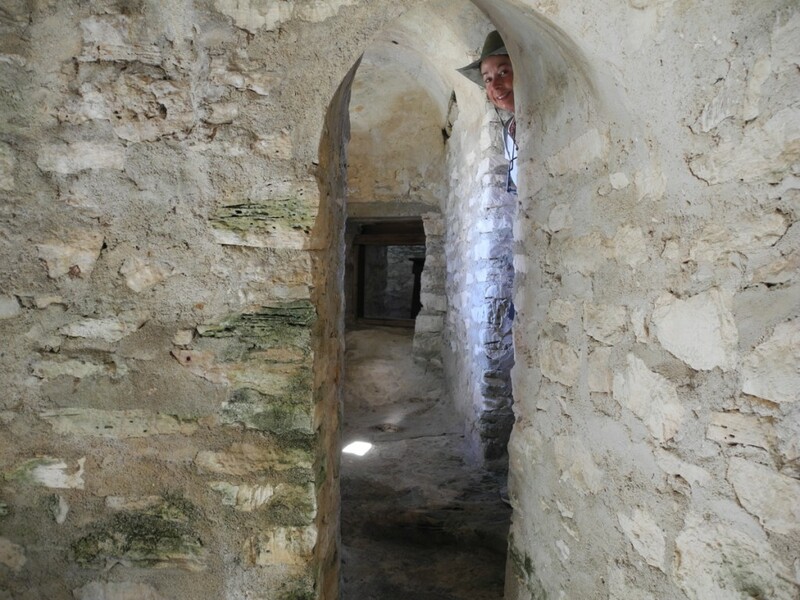 It is open to all and has been restored over the years. Thirty miles up the coast of Cat is Orange Creek Settlement. It sounded nice and turned out to have a gorgeous deserted beach. On the ride up the poles went out but this time it was a 34 inch Barracuda that we hooked. 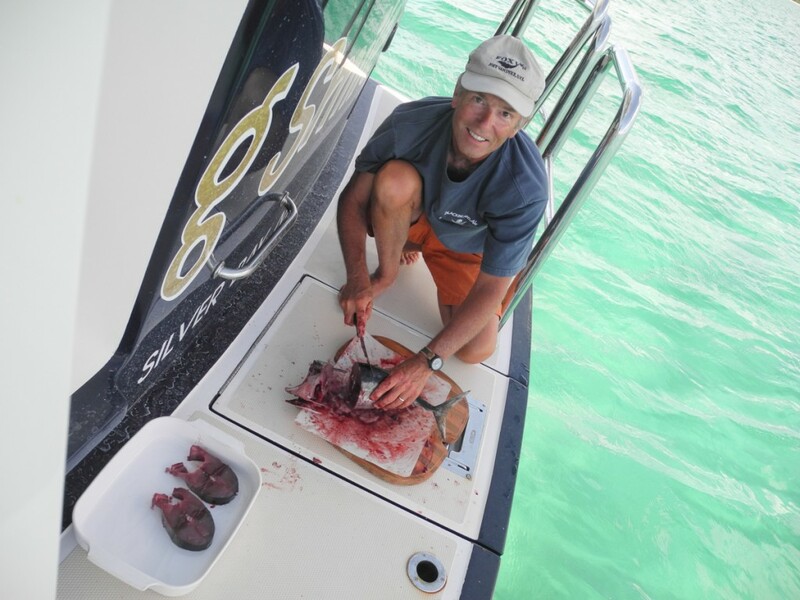 They are nasty looking and can be eaten but also are known to carry Ciguatera. This food borne illness is caused by eating certain reef fish whose flesh is contaminated with toxins. 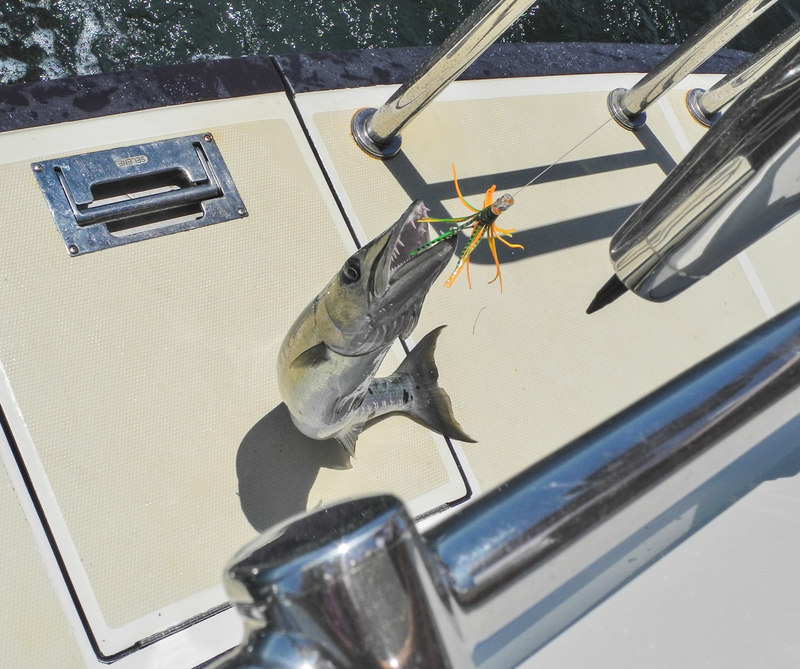 Large Barracuda eat many of the smaller reef fish and it accumulates in their flesh. Overboard went the Barracuda. 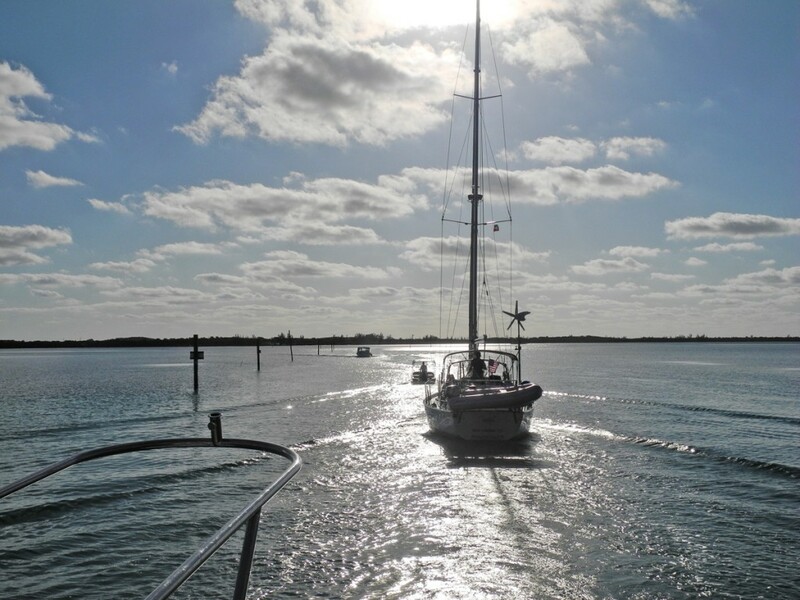 Our original intent after leaving Orange Creek was to anchor for the night at Arthurs Town, just an hour south of Orange. Arthurs Town is the boyhood home of Sidney Poitier. The anchorage was not at all protected and after three hours of bouncing we decided to move on to the island of Little San Salvador. A pleasant three hour ride had us anchored it what looked like a Hollywood set. Little San Salvador (also known as Half Moon cay) is owned by Holland America Line. Holland America purchased the entire island in 1996 and it is a cruise ship destination. To their credit Holland America has only developed 50 of the 2400 acre island. What you see from the anchorage does make you laugh. 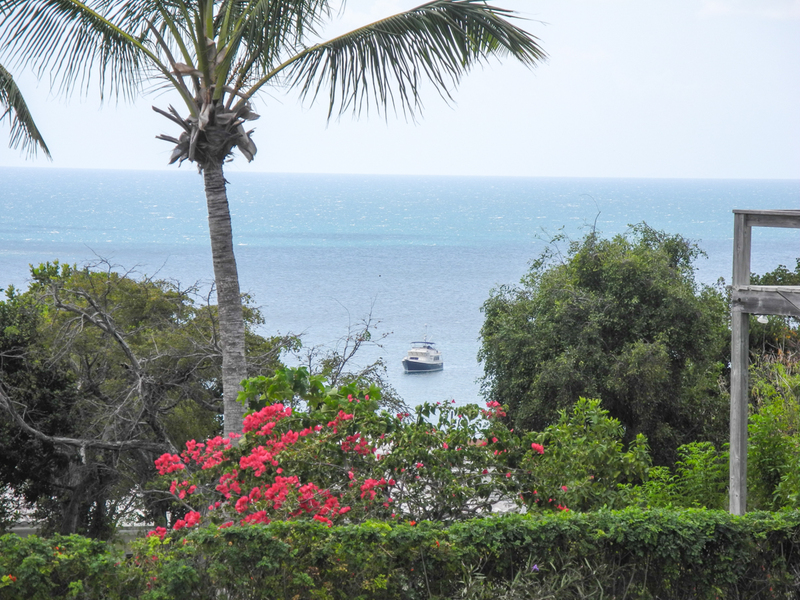 In our two nights of anchorage no cruise ships appeared but a sailboat came in while we were out snorkeling. It turned out to be Jim and Beth on their Passport 49 “Silverheels”. As mentioned we had met them in Emerald Bay a week prior. Being the only two boats in the bay we invited them over for cocktails. It was to be the start of a great friendship. Our next island to visit is one I have been looking forward to for decades. 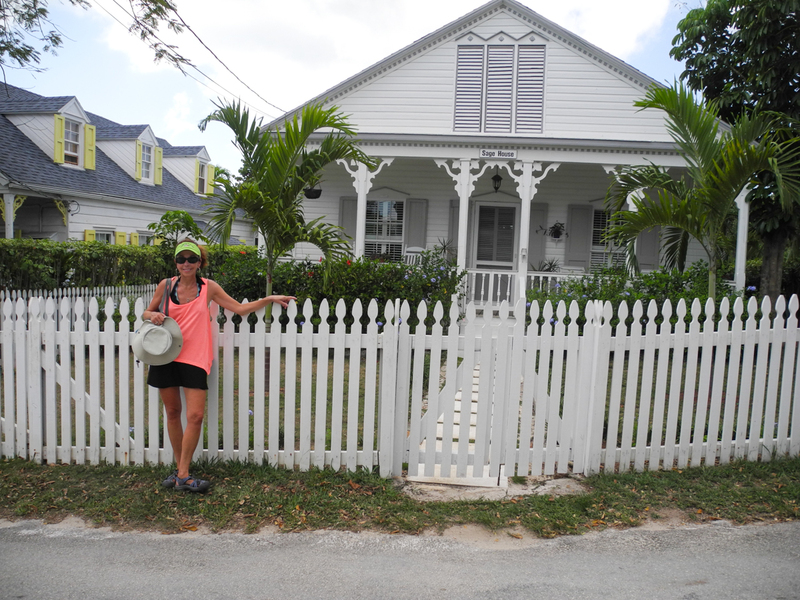 In 1974 we had a family vacation to Eleuthera and stayed at Winding Bay beach cottages near Rock Sound. The beach as I recalled was beautiful and so was the small resort. 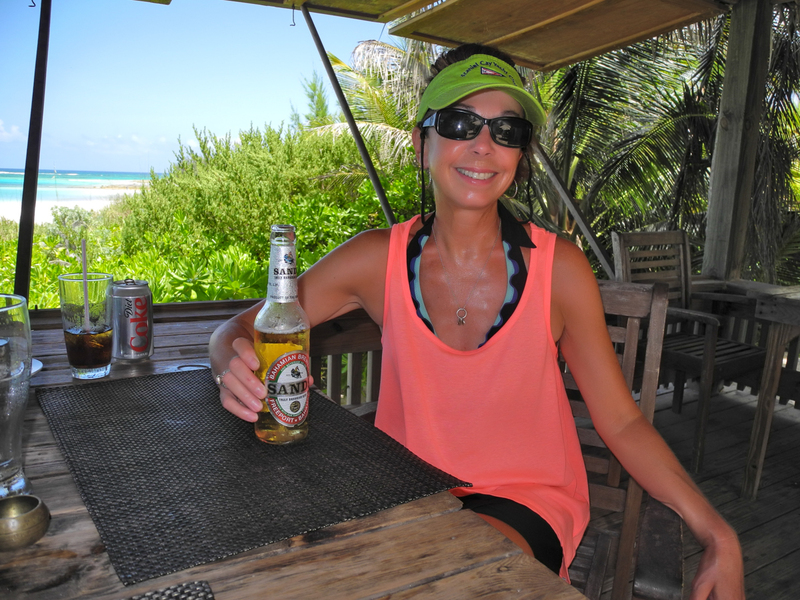 It was my favorite island vacation as a kid and I have always wanted to revisit the resort and beach. 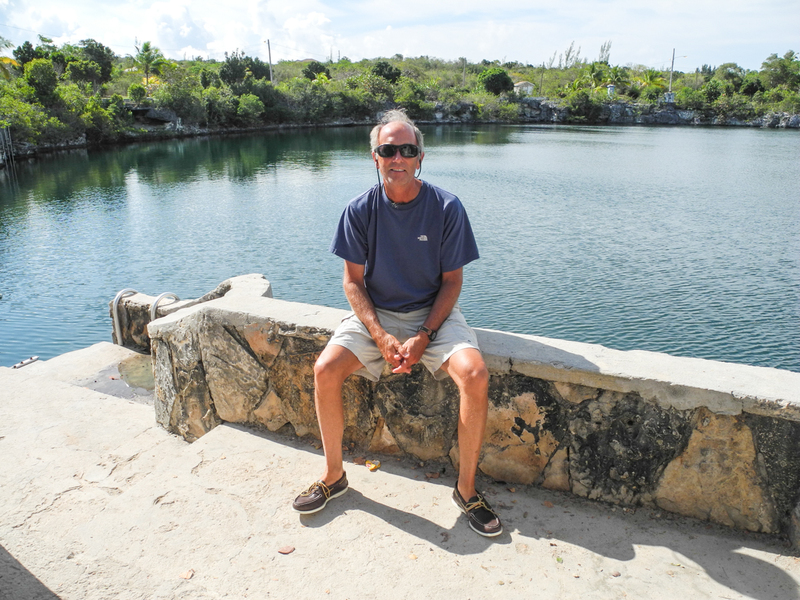 Four hours after leaving Little San Salvador we pulled into Davis Harbor on the south end of Eleuthera. 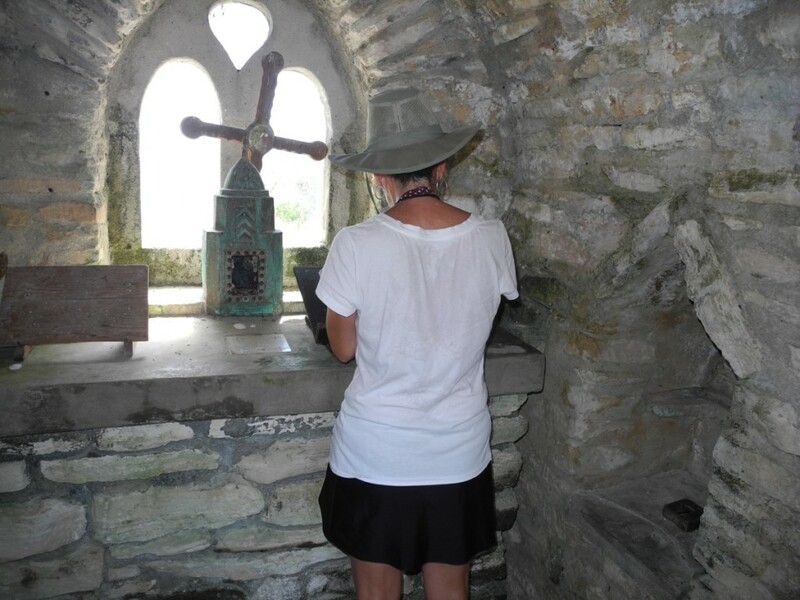 The island of Eleuthera has had a varied and very interesting past. Originally occupied Arawaks this native population were deported by the Spaniards to work in mines and eventually died out. The first Europeans to arrive came in 1648. Known as the “Eleutherian Adventurers” they gave the island its name. The island prospered for many years and several well know American industrialists including Arthur Vining Davis, Juan Trippe and Henry Kaiser invested in various businesses. 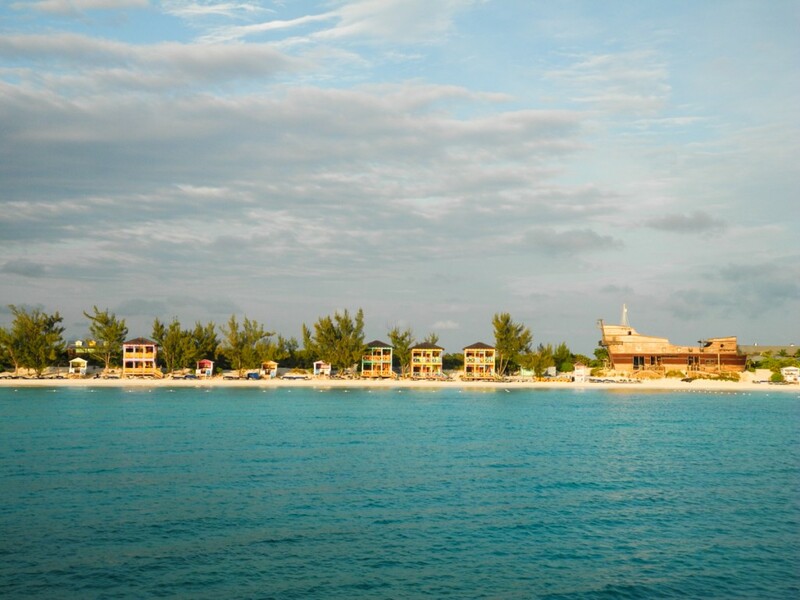 Unfortunately due to changes in foreign ownership laws when the Bahamas gained their independence in 1973 all of the large resorts or agricultural businesses were abandoned or forced to be sold to government favored Bahamian interests. 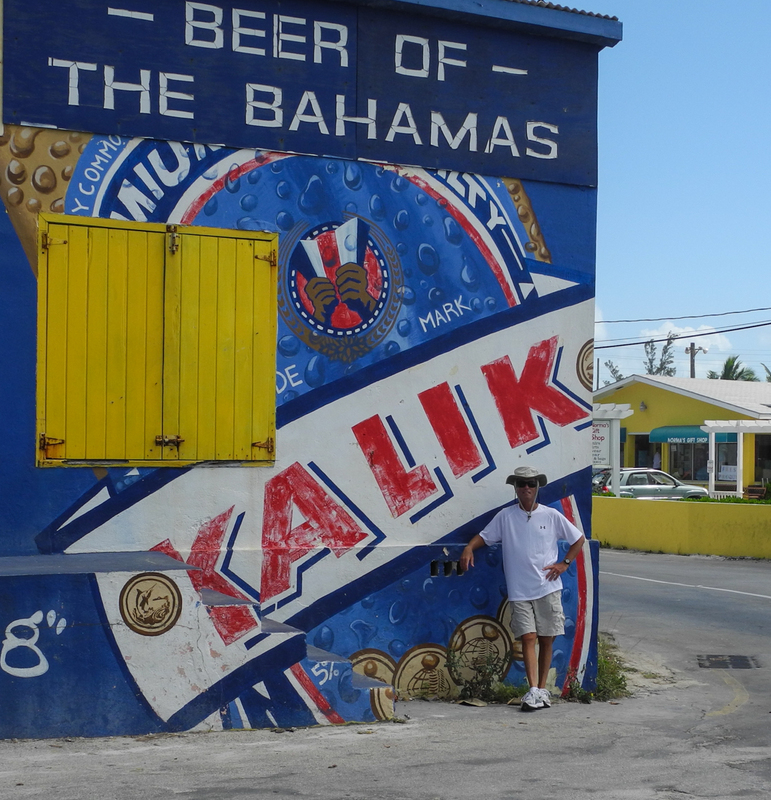 The Bahamians did not know how to run these businesses and corruption, greed and incompetence closed many of them. Today some resorts are coming back but alas Winding Bay Beach Cottages no longer exists. It was not government takeover though it was the forces of nature. Hurricanes have taken their toll and Winding Bay Beach Resort was destroyed decades ago and the successor resort Venta Club was destroyed by Hurricane Floyd in 1999. We rented a car for a 24 hour period to find my beach and other sites that I recalled from long ago. The beach we found but it is not as nice as I remember. No signs of the resort we stayed out exists and the Venta Club is boarded up. 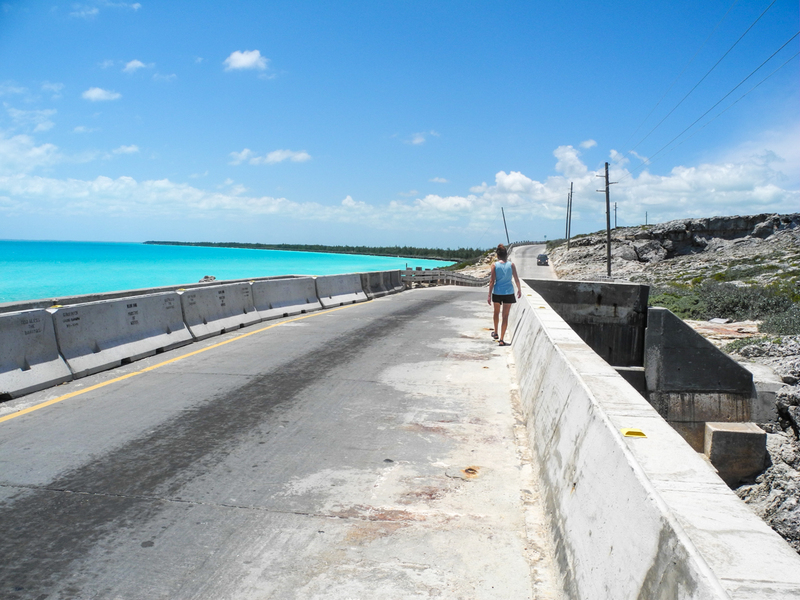 Eleuthera is 110 miles long and averages maybe 1.5 miles wide. One main road runs north/south. We did not drive the entire length but it was fun to visit some of the old towns that I remembered. They included Tarpum Bay, Rock Sound and Governors Harbor. Heading back south to the marina we stopped at a small road side restaurant for a late lunch. There we met the owner Gigi who had recently lost her husband to a motorcycle accident. Gigi is a delightful woman. 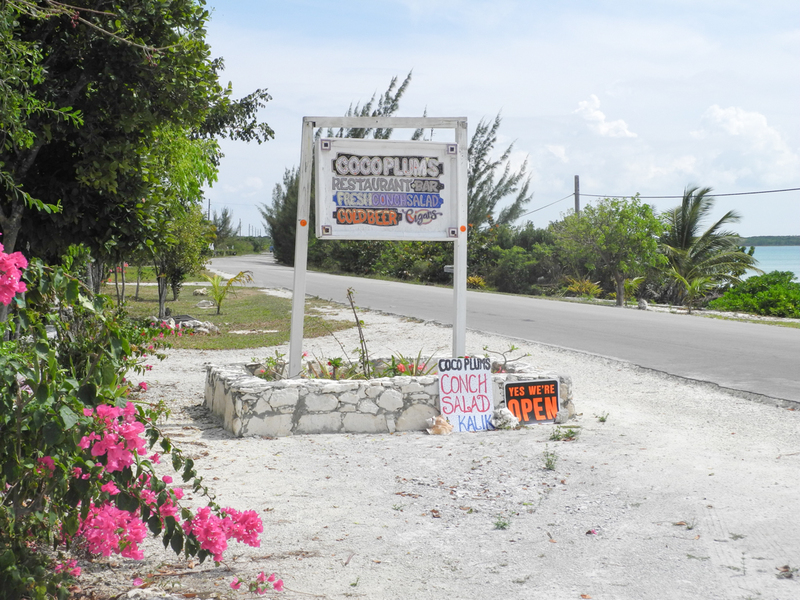 Her fresh conch salad and fritters were superb. 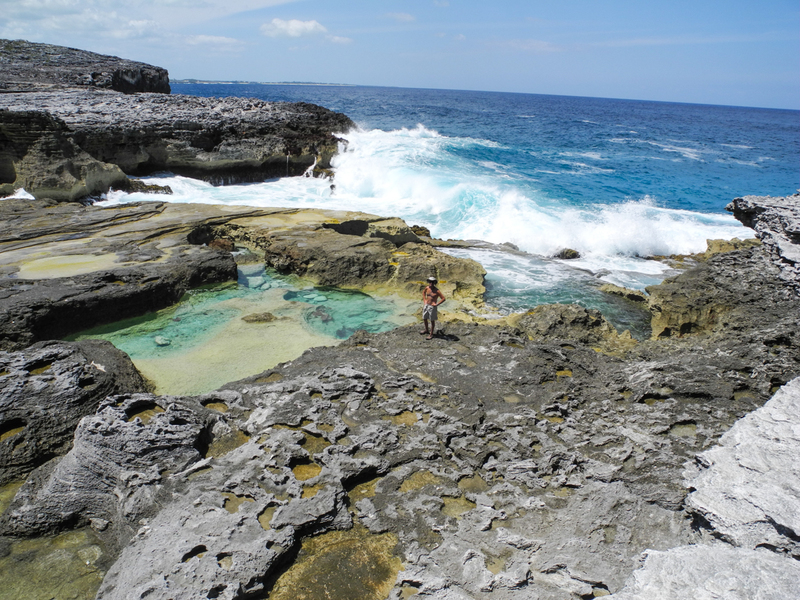 There is an Ocean Hole on Eleuthera in Rock Sound. While on my 1974 vacation I was able to borrow a scuba tank and remember well the fish and turtles I chased down the walls. The Ocean Hole is a natural “blue hole” and connects to the ocean hundreds of feet down. It of course is still there and a small park has been built to provide access to the clean waters. We were told by Gigi that this is where local children learn to swim. We left Davis Harbor marina and cruised north to Governors Harbor. 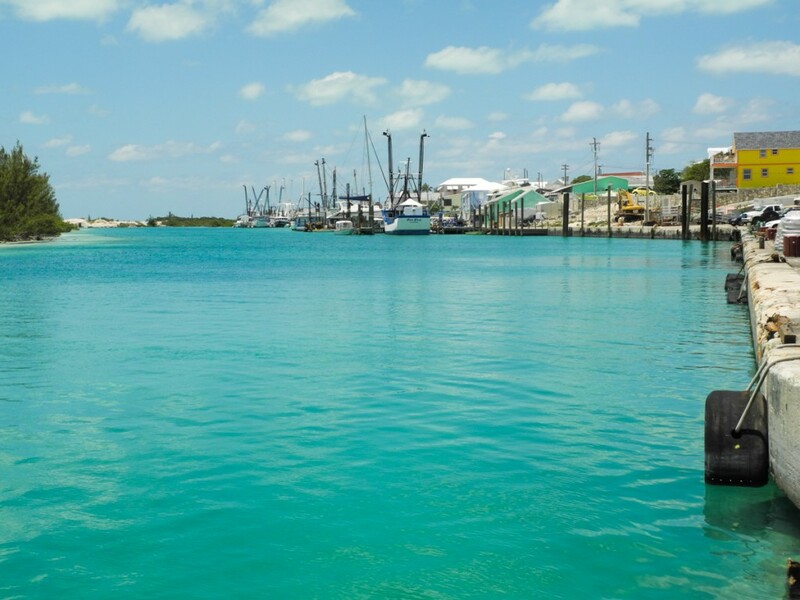 With a large well protected anchorage Governors Harbor should not be missed. 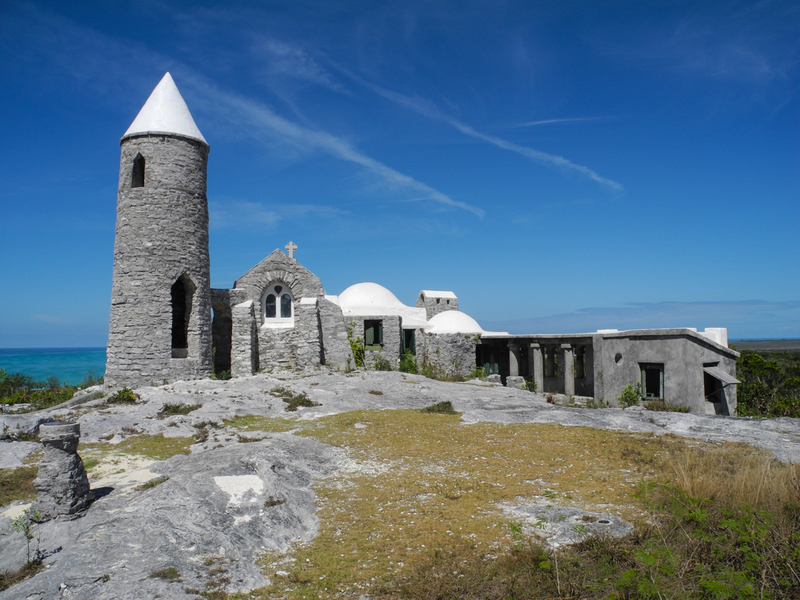 It is the capital of Eleuthera, the largest town and has many beautiful, Victorian era homes. The anchorage proved tough for us as we could not get it to bite into the grassy bottom. On our second attempt we actually hooked some sort of underwater cable. When I dove on the anchor and saw the situation I was reluctant to touch it as I could not see the ends of the cable and had no idea if it was energized. After five attempts and moving around the bay we finally got it to stick. The town is very steep. After dinghying ashore one walks up a long road to the “summit” before descending down the east side to the Atlantic. 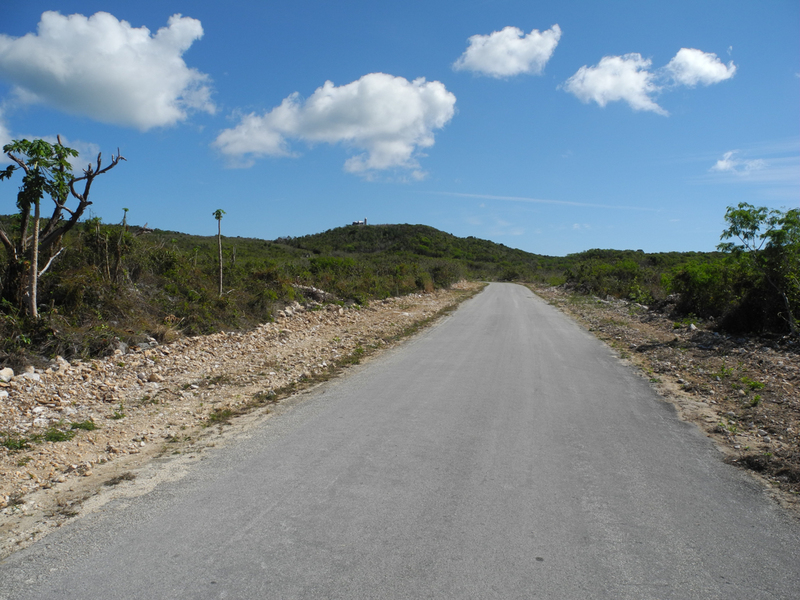 It is a very nice walk however and eventually brings you to the nicest beach we have ever seen in the Bahamas. 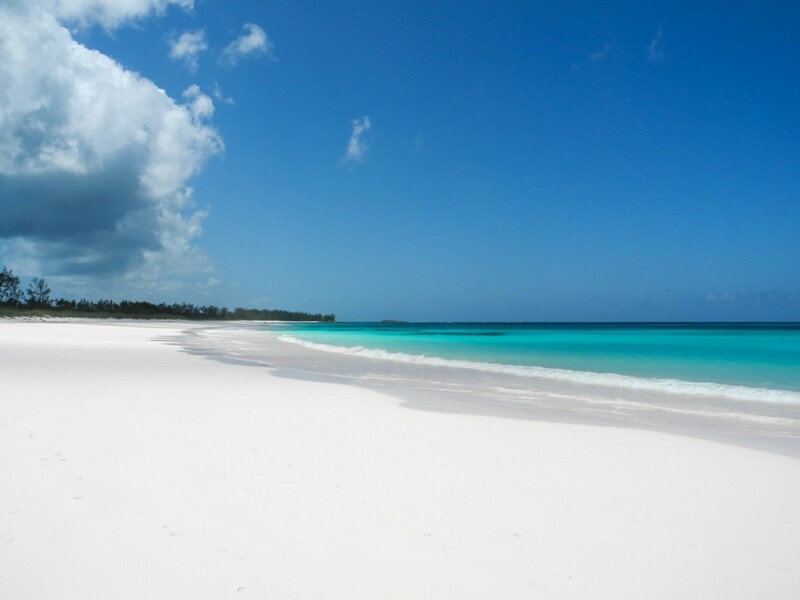 French Leave Beach is both long and wide with exquisite sand and water. Towards the south end is a bar/restaurant called “The Beach House”. 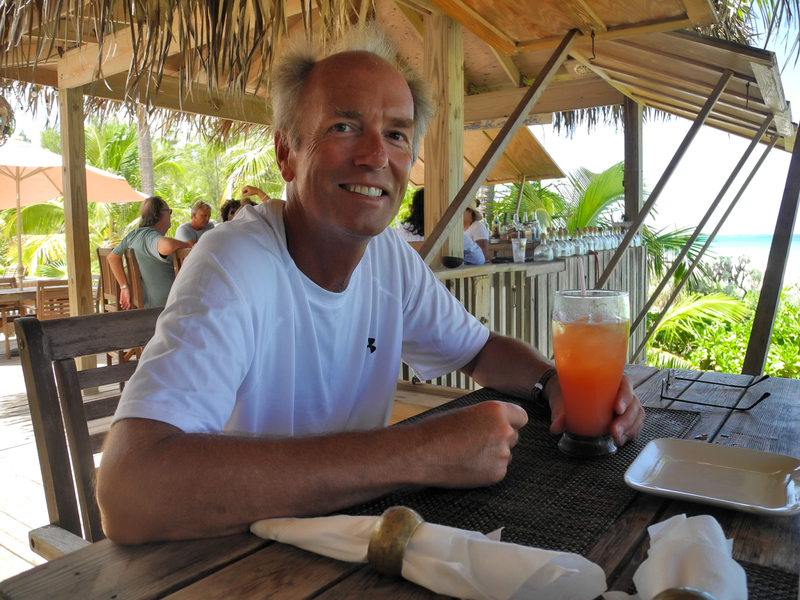 It is on the beach and offers not only a fantastic view but awesome food too. There was once a Club Med on the north end but no sign of it could be seen. Hurricane Andrew wiped it out in 1999 and it was never rebuilt. From the top of the hill above town one can see the harbor and Cupids Cay, a tranquil section of Governor’s Harbor. Heading down from the top you pass numerous pastel painted homes that date to an earlier era. Farther up the island is a place called the “Glass Window Bridge”. It is here where Queens Highway crosses what is sometimes referred to as the narrowest place on earth. 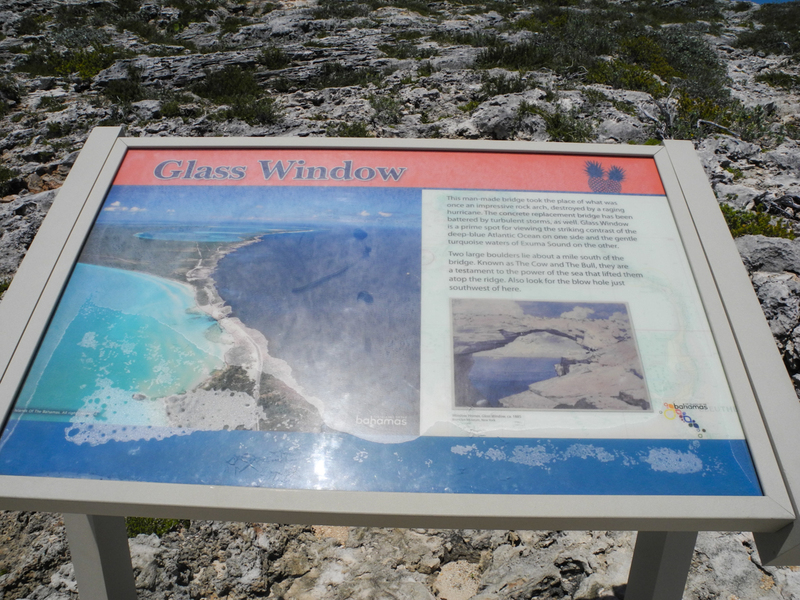 It is where you can stand and view the dark blue waters of the Atlantic and turqoise green waters of the Caribbean. The “Glass Window Bridge” was painted by Winslow Homer in 1885. At that time it was a natural stone bridge created by nature. That bridge was destroyed by storms in the 1940’s and subsequent bridges have been built and destroyed. It is fascinating to visit. We anchored for a few hours just south of the bridge and took the dinghy ashore. It had been 40 years since I last stood on the bridge. Just south of the bridge we found a small sign pointing to a historic area on the Atlantic side. We found no buildings but did discover a sensational carved rock bay/canyon. It was low tide so we were able to easily and safely climb down to enjoy the hollowed out caves and pools. 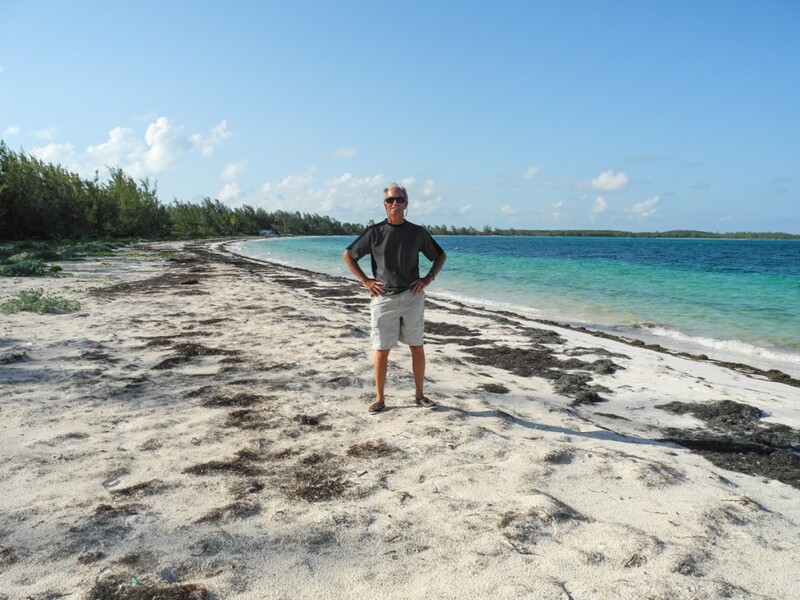 Before crossing over to the Abacos to meet up with our son Andrew and his girlfriend we had one more island to stop and explore. 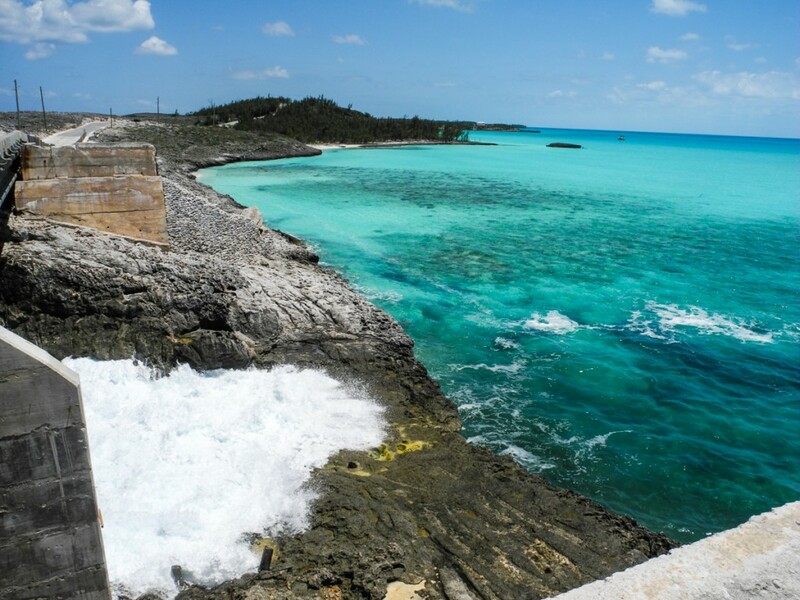 St Georges Cay lies just to the west of the northern tip of Eleuthera. 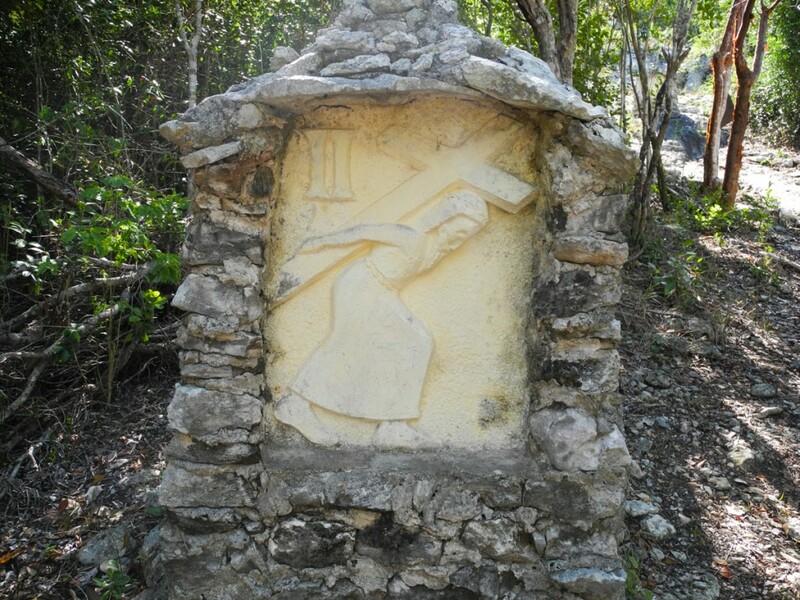 The entire Cay is comprised of the settlement of Spanish Wells and most people including us only knew it as Spanish Wells and had never heard of St Georges Cay. Spanish Wells is a charming little community measuring 2 miles long and a half mile wide. It is predominantly a fishing village. Golf carts are the way to get around and so we rented one for the day. We also happened to be in the same marina as our friends Jim and Beth and joined them on board for cocktails the night before departure. 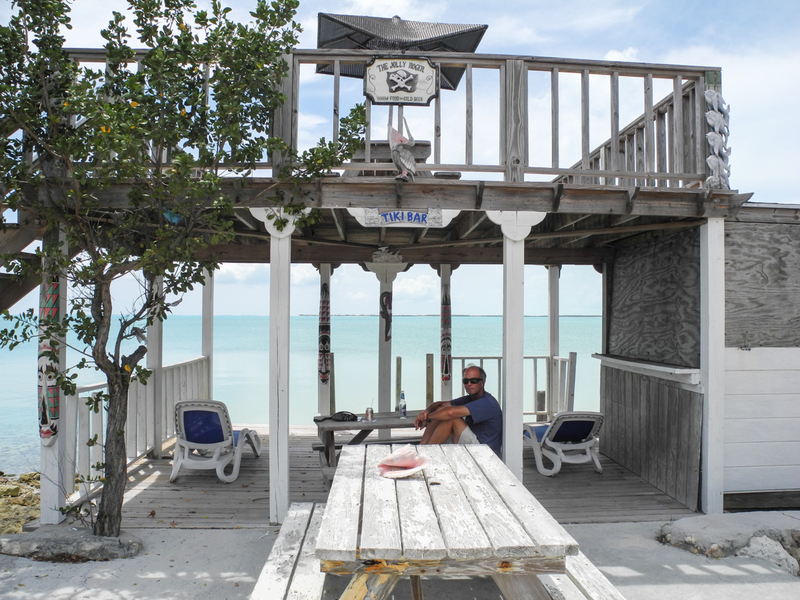 They, like us, were meeting their kids in the Abacos. They had arranged for a guide to take them thru what’s known as the “Devils Backbone” on the north side of Spanish Wells. 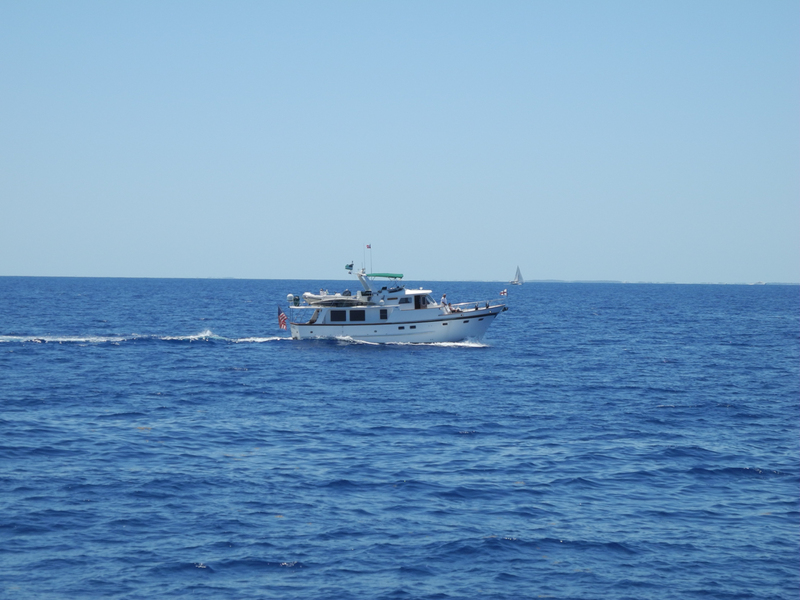 This is an area of difficult to see and navigate reefs and most captains elect to hire a pilot boat. Jim asked if we wanted to follow them out the next morning and split the cost. We jumped on it as we had not made any prior arrangements. I think every boat at the marina was leaving that Tuesday. Forecast called for calm seas and a northeast breeze. 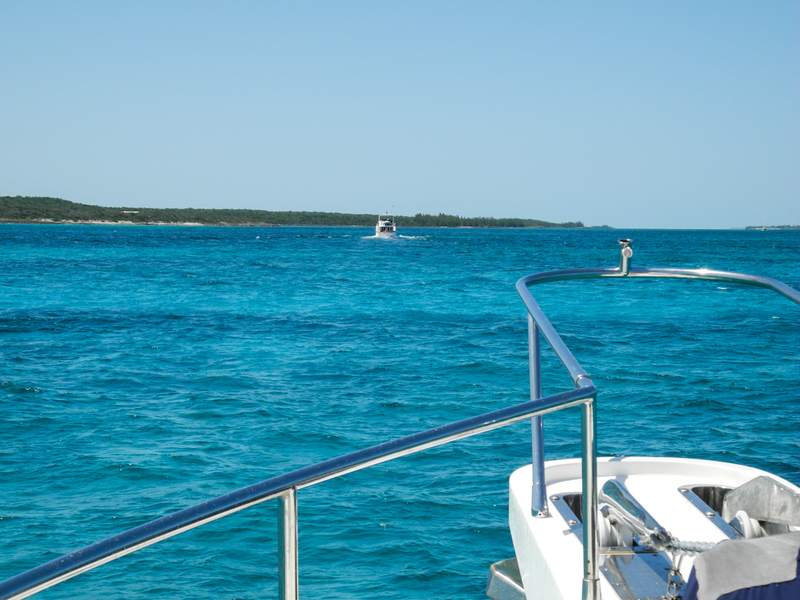 We had not seen calm seas in over a week and the crossing from Spanish wells to the Abacos is open water with nothing between you and Africa. 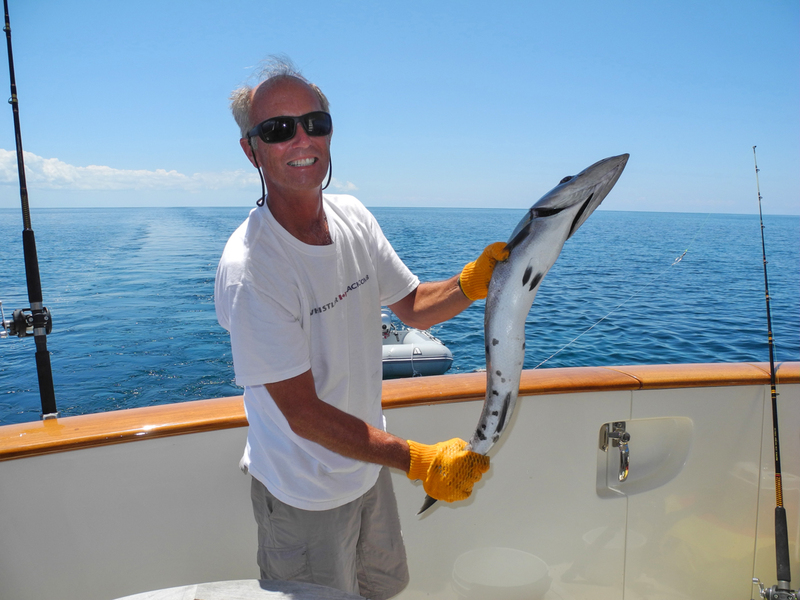 We pulled out of the marina following Jim and Beth on “Silverheels” and our guide boat “Little Woody”. The crossing was smooth and the fishing was superb. 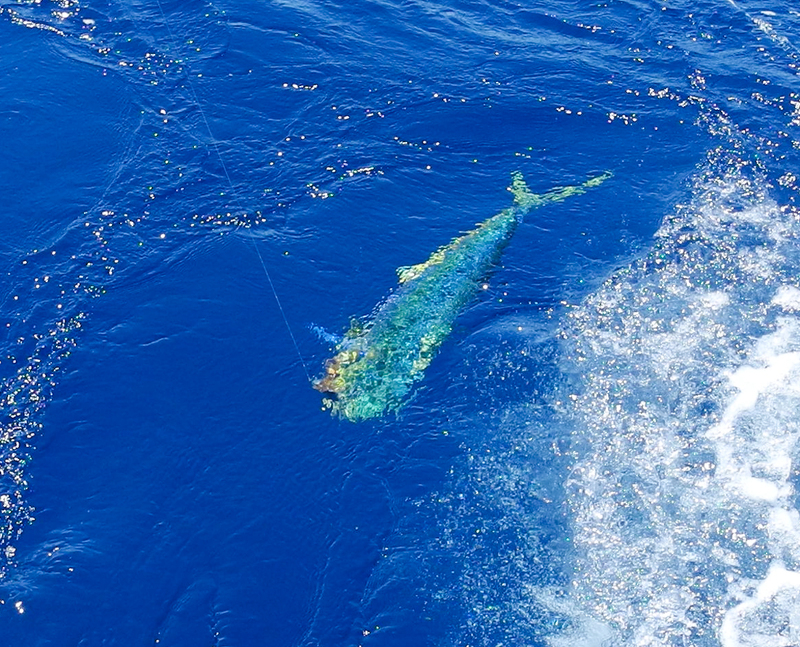 I caught my first Dolphin (Mahi-Mahi) but as Cath and I were bringing it into the boat our tackle broke and we lost a gorgeous fish. Many boats chose this day to cross as the weather was perfect. 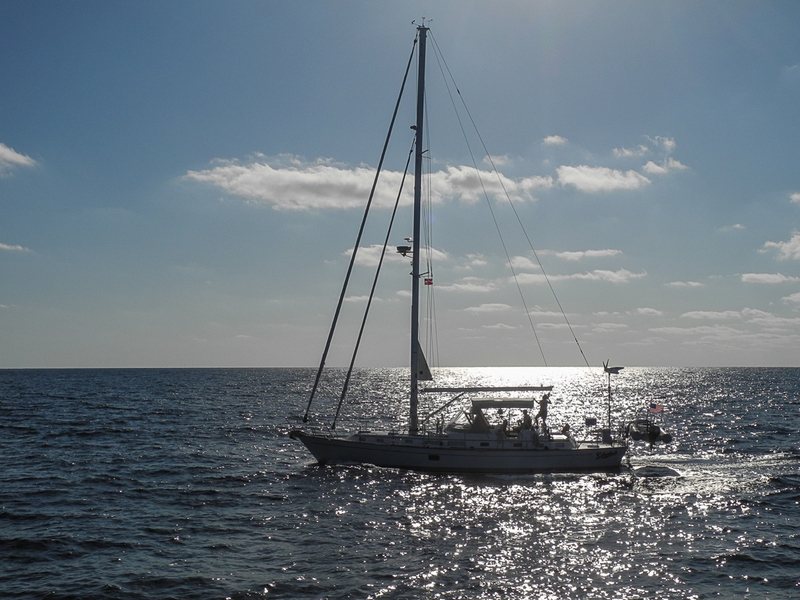 Approximately 7 hours later we motored thru a benign Little Harbor Cut and anchored behind Lynyard Cay.